You are here: Home / Articles / The teenage pitch invader – does the ban fit the offence? The teenage pitch invader – does the ban fit the offence? Many of you will have either seen or read the news yesterday about Mitchell Perry, who invaded the Liberty Stadium pitch during the recent Swans v Bristol City Championship game. The teenager, who was attending his first Swansea City game, was sat with friends in the North Stand and having drunk four or five pints of lager, decided to run onto the pitch in order to be seen on television. 19 year old Perry from Briton Ferry, pleaded guilty to encroaching onto the playing area at a football match, when he appeared before district judge Chris James at Swansea Magistrates’ Court. The court heard that Perry, also known as Mitchell Budge, had no previous convictions and that the incident had involved no violence or other aggravating factors. Perry was subsequently fined £100 and ordered to pay £85 towards prosecution costs and a £30 victim surcharge. Going within 2,500 metres (1.5 miles) of the Liberty Stadium for five hours either side of a match. Whilst his misdemeanour was stupid and his reason for doing so somewhat immature, Perry did break the Football (Offences) Act 1991, part of which stipulates that “Going onto the playing area” an offence and subsequently should be punished. But in this instance, it is debatable whether or not the conditions of the football banning order (which is different from the FOA 1991) he received, actually fit the offence, as they do appear to be quite excessive in my opinion. It is a view that seems to be shared by The Football Supporters Federation Amanda Jacks, who assists fans with policing and stewarding issues. She is also the person behind the extremely interesting (and useful) FSF Faircop on Twitter. * If he has one, surrender his passport when Wales play overseas. For at least 2 years. All this as a “deterrent”. No mention in the report of correct tests being applied. All this exclusive to a football fan thanks to legislation that is surely due a review. The FSF see plenty of Football Banning Orders cases throughout the football season, so it is interesting to see their take on the court ruling. Don’t get me wrong, Perry deserved to be punished, but when you look back at other FBOs issued to Swansea fans, you can see a significant difference in the nature of his offence when compared to others. Another 19 year old Swansea fan from Llanelli, was given a similar ban back in 2011, but he had been found guilty of causing disorder at three different Swans games. Back in April 2012, five Swansea fans were given banning orders of a similar nature, but again they were actually found guilty of causing or contributing to violence and disorder. And the same again in June 2012 when four more were found guilty of the same offences. 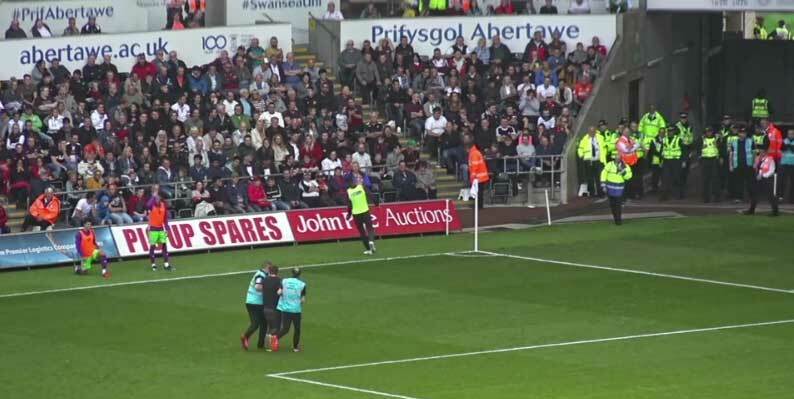 Whilst it is understandable that the judge wanted the sentence issued to Perry to be used as a deterrent to other wannabe pitch invaders, it nevertheless does seem somewhat over-zealous when perhaps a suitably hefty fine and possible ban, issued by Swansea City Football Club themselves, would have sufficed on this occasion. What do you think? Join the debate on our Swansea City Forum.